If your child is a picky eater, your family doctor may have recommended that they have a vitamin supplement to ensure they are receiving the nutrients they need. However, it has turned into a battle getting them to take it because they can be tasteless and chalky. To get past the daily struggle, you are considering fun flavored gummy vitamins. 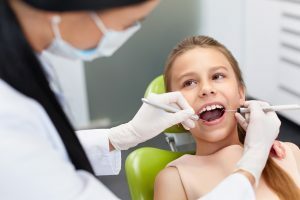 While they may seem like the perfect solution, chances are your dentist in Kaukauna will likely advise against their use to protect your child’s teeth. Gummy vitamins may seem like the perfect answer to get your child to take their daily supplement without a struggle. However, while they may be getting the nutrients they need, you could cause damage to their teeth. These vitamins contain sugar and consist of a gooey texture which sticks to the teeth. This makes it difficult to remove, especially in hard to reach places like the back molars. As a result, the sugar sits on your child’s teeth, slowly eating away at their enamel until a cavity forms. While you may think just one gummy per day is not enough to cause damage, you might be surprised to learn that it only takes 20 minutes for acids to form, eroding their teeth. Although there is currently no published research connecting the use of gummy vitamins with causing tooth decay, it is well known that sugary and slicky foods can cause cavities. With tooth decay the leading chronic condition dentists treat in children, it is recommended that you take extra precautions if you choose to use this form of supplement. If you cannot get your child to take a traditional supplement, you can still choose the gummy form if you use a little extra care to protect their teeth. Timing is everything. If possible, it is best to give them the supplement at meal time. The chewing of foods along with it will help to remove the sticky accumulations from their teeth. In addition, it is best if they do not have it before bed time or after brushing their teeth. The ideal time to give it to them is before they do their morning or nightly oral hygiene routine. Have them pay extra attention when cleaning the molars while brushing to help remove the sugars and stickiness left behind. If you choose to give your child gummy vitamins, it does not necessarily mean that they will get cavities. However, you must remain proactive about their oral hygiene to protect their teeth from damage. Your children’s dentist in Kaukauna can also offer additional tips to help reduce their risk for tooth decay. Dental Expressions brings modern dental care to your family, treating patients of all ages. Our dental team caters to each patient’s individual needs to promote healthy teeth and gums. With a focus on prevention, we will help you protect your child’s smile from damage, like tooth decay. If you have any questions about your child’s oral health, contact Dental Expressions today to schedule a consultation.